Last year a number of musicians friends and I we’re tossing around the names of various bands and comments were raging as we debated the pros and cons of each of their work. Late in the evening we turned to metalcore and focused on a band that is at the top of genre, August Burns Red. The question was raised as to how each ABR album has been able to consistently improve on their previous release. The reason is simple and straightforward, August Burns Red doesn’t like metalcore, or at least the state that the genre is in. I met with Jake Luhrs at concert last year and asked him about the changes and developments of each album and how their music was bridging into art-metal. Honestly, the simplest response to that is just progression. Growth in the band as musicians and as we mature into adulthood and grow in the music world. I think it’s just the direction that we are naturally taking. It’s not anything that we’ve said ” hey, this is what we’re gonna do”. It’s just what’s evolving from our musicianship. I like it. It’s a cool direction, because I think it’s something more clever and for August Burns Red we never wanted to be the same, ever. We do want to experiment, we do want to go outside the box and we don’t want to write the same record over again. When I asked about what makes August burns Red different from the rest of the industry, he responded with boldness. That’s a really difficult question and however I respond to this I just want people to know that it’s not an ego trip or boasting by any means, cuz I don’t like doing that. […] And every musician, I’m sure, that you would interview and ask this question would say “Well, we’re different this way”. Quite frankly, I think a lot of bands aren’t different from one another and it’s really hard to find something that is new under the sun. The unfortunate fact is that metalcore bands often churn out cookie cutter versions of their past work without embarrassment. August Burns Red has been around for a decade and show no sign of simply producing music simply because it;’s their profession. Instead the band continues to produces music that stretches both themselves and their listeners to a higher level. ABR’s third album, Constellations, found the band beginning to stretch their sound out of the self-imposed musical boundaries of metalcore. Their 2011 follow-up album, Leveller, took these experimental elements to a higher level. 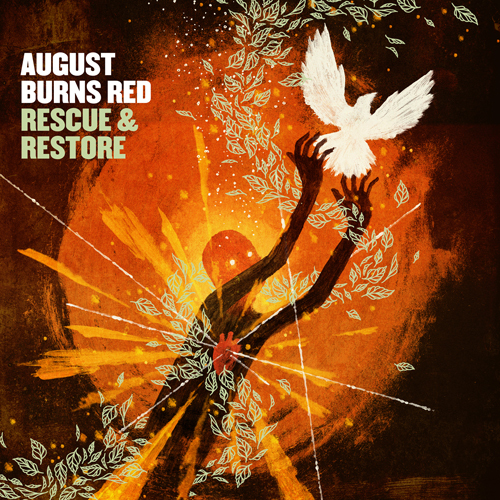 August Burns Red’s latest release, Rescue & Restore, has broken all the boundaries for both themselves and all metal bands. That bold statement differs significantly from the results found in much of the genre. Metalcore bands often churn out cookie cutter versions of their past work without embarrassment. August Burns Red has been around for a decade and show no sign of simply producing music simply because it;’s their profession. Instead the band continues to produces music that stretches both themselves and their listeners to a higher level. ABR’s third album, Constellations, found the band beginning to stretch their sound out of the self-imposed musical boundaries of metalcore. Their 2011 follow-up album, Leveller, took these experimental elements to a higher level. August Burns Red’s latest release, Rescue & Restore, has broken all the boundaries for both themselves and all metal bands. Don’t expect to find any any fillers on this release, each song is deliberately and wonderfully crafted to mesh into a symphony as August Burns Red reintroduces art into metalcore. “Beautiful” may be an unusual description to apply to a metalcore album, but on Rescue & Restore it’s fitting. A wonderful blend of raw vocals and unusual musical stylings takes the listener on a flight of fancy that has been created by August Burns Red. The musical abilities of each of the members have always been to be second to none. On Rescue & Restore this technical proficiency is brought to the forefront with each of the members talents being highlighted. ABR is a well oiled machine and all of those parts are wonderfully synced to each other. August Burns Red’s quest to expand the sound of metalcore is facilitated by introducing unusual musical elements on Rescue & Restore. “Treatment” demonstrate some of this instrumentation using violin, piano and cello. During the musical bridge, “Treatment” brings a reminder of the salsa music flavour found “Internal Cannon”. “Spirit Breaker” and “Provision” also make use of violin and cello. The most creative track of the album is found on the aptly titled “Creative Captivity”, a primarily instrumental track. JB Brubaker forgoes his guitar on “Creative Captivity” to put his hand to a guzheng (Chinese harp), violin, cello, and trumpet also take part. Jake Luhrs adds his vocals near the end of the song where he speaks about the downfall of today’s metal scene. This is a barren wasteland, a lonely place where inspiration goes to die. Rescue the beauty that’s left. Restore the character that’s long since gone, because these colors must never fade. This beat must carry on. We will fight to save this. We will fight to keep it alive. This is a cause worth fighting for. We will rescue and restore. Don’t think that Rescue & Restore has dropped all of the characteristics of metalcore. It hasn’t. This is a hard-hitting album with dark songs such as “Fault Line and the album closer, “The First Step”. My music collection includes over a thousand albums, but very few of those ever make it to the top of the heap. Rescue & Restore has made it and will likely remain there for a very long time. Rescue & Restore can be regarded as the greatest release of 2013. In the future it will undoubtably be considered as one of the best of this decade and the album that sought to rejuvenate the world of metalcore. “Spirit Breaker” gives a hint of what is found on Rescue & Restore from August Burns Red.